Woot! Woot! I’m happy. Can you tell? Yes, got that much. Why? That’s right! It’s amazing how the power of people can manifest. All it took was the power of the internet and the will of others and, boom! It was a long time coming, heck, several years in fact, but the end result was worth the wait. I wasn’t sure if it was true, so I checked it twice and, sure enough, it’s a fact. What’s a Fact? Jez, what are you on about? 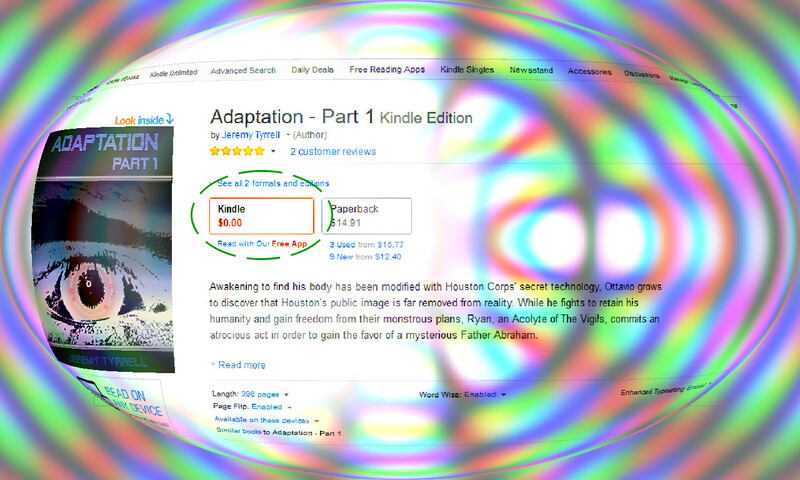 Why, Adaptation – Part 1 is now perma-free, as it should be, on Amazon. Just like Grosvenor Lane, just like Atlas, Broken. Just like… oh, wait. Jolimont Street Ghost still isn’t free, darn it. But, hey, let’s celebrate the win, shall we? Now, if you’ll excuse me, I have a happy dance to do. CategoriesWriting TagsAdaptation, Amazon, ebook, Free, Free eBook, Happy Dance, Kindle, Kylie Minogue, Make it Free, Part 1, Perma-free, Success, Woot! Previous PostPrevious What’s in the Box?